The MobiPOS is designed to cope with every aspect of table service, complimenting your POS solution, at an affordable price. 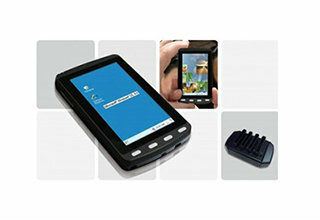 The robust and ergonomic mobile POS device is IP54 rated making it dust and splash proof and also features enhanced Wi-Fi reliability and power saving technology. Ideal for harsh hospitality environments, the lightweight MobiPOS is available with unique add-on modules including, integrated Bluetooth and WIFI. The MobiPOS ordering system eliminates the need for staff to leave the service area, keeping them on the service floor attending to customers' needs, thus improving the customer experience and staff productivity. Once installed, you will be able to perform a vast array of functions without needing to input the order information into the POS Terminal, allowing you to cater for the needs of your customers immediately. The MobiPOS gives you the flexibility to take orders on the move, whether that is for table side ordering, pay at table or queue busting applications.